Sometimes, it seems like the 'burbs get no love when it comes to food. It appears that there is this invisible wall that prevents Vancouverites from venturing out of their comfort zone. North Vancouver is no exception, even though it is only a Seabus ride over to the North Shore. Case in point, it is like pulling teeth with Gadget Girl trying to convince her to eat around Lower Lonsdale, even though we play hockey at North Shore Ice Sports! So when I got an invite from The District Group to do a mini-food tour of their 3 restaurants, I was more than willing to travel across the Ironworker's Memorial Bridge (well, not during rush hour at least...). 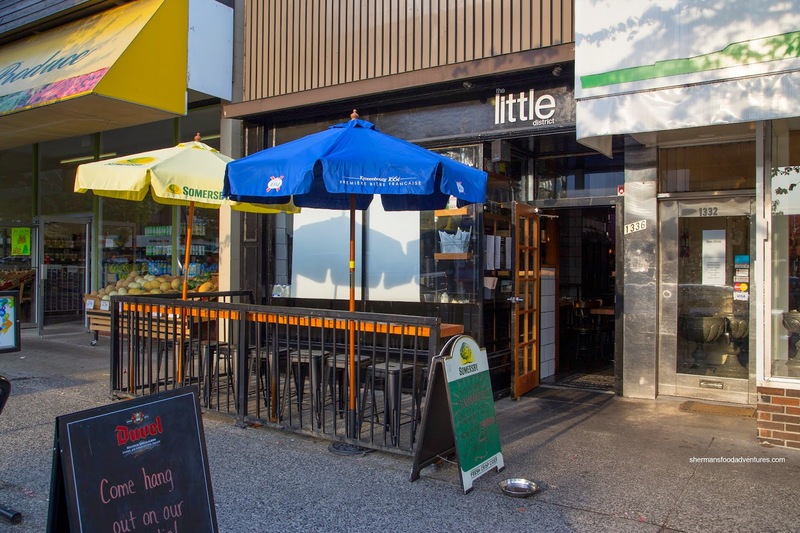 Our first stop was at The Little District, which is a smaller edition of The District, that serves up fun contemporary American eats (to go with a beverage or two). We did end up with 2 cool beverages in the Mojito and Modern Mule. 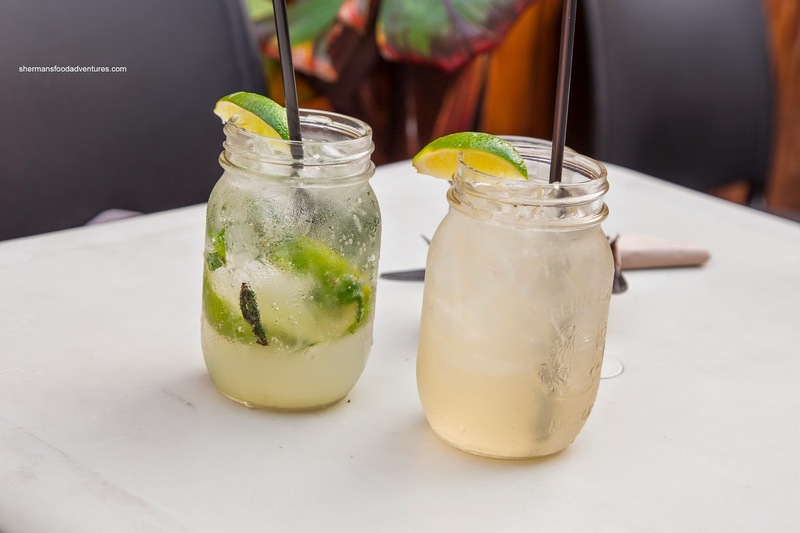 On a warm day, the Mojito was refreshing and light where the classic flavours of rum, lime and mint came through. However, Viv remarked that it was not very strong, which suited her fine anyways. I had the Modern Mule consisting of Absolut, elderflower and ginger beer. Suffice to say, this had a considerable bite from the ginger. 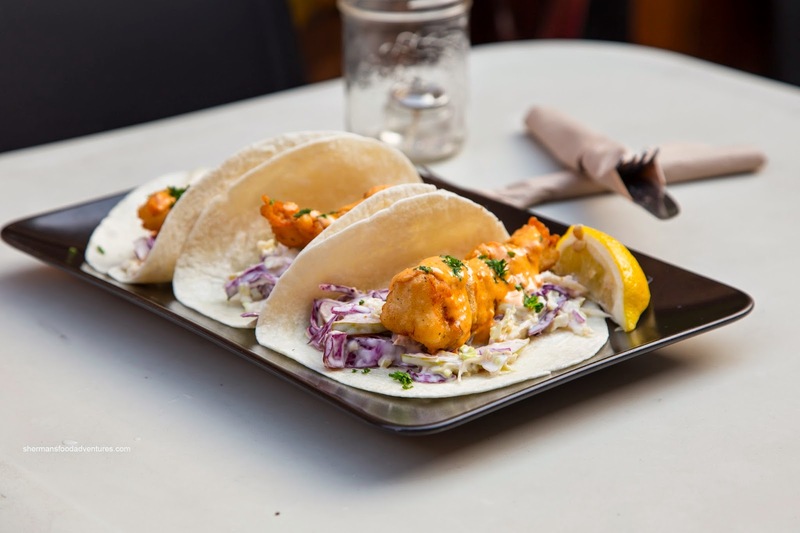 For our eats, we had the Fish Tacos with battered cod, apple slaw and Spanish paprika mayo. The super-thin batter was lightly crisp and seasoned while the fish was flaky and moist. We found the slaw to be crunchy with a bitter finish from the radicchio (needed a bit more acidity). As for the tortilla shell, I would've liked to see it grilled because it was a bit lifeless. 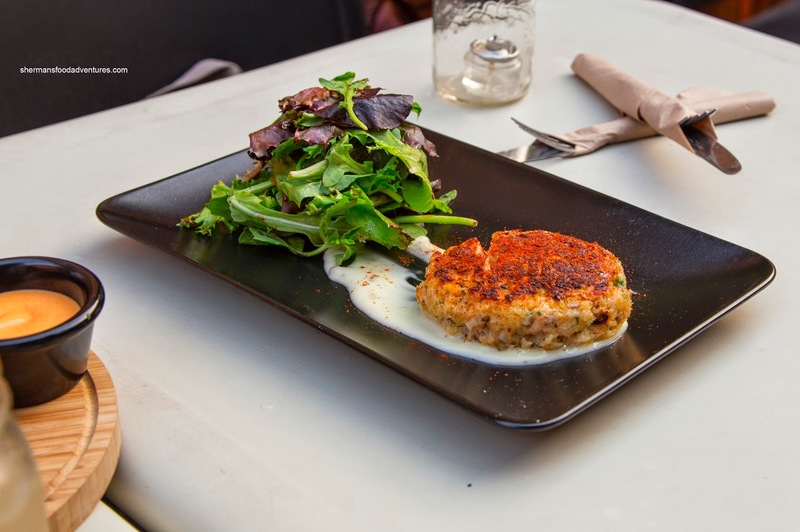 Onto our next item, we tried the Crab & Shrimp Cake made with blue crab and shrimp finished with a candied lemon mayo. We liked the crispy and browned exterior that gave way to a soft interior. There was a balanced mix of fluffy crab, meaty shrimp, onions, minced green pepper and chunks of garlic. On its own, the cake wasn't particularly flavourful as it was conservatively seasoned, but when combined with the sweet and zippy mayo, it came alive. Now, I may sound a bit off-my-rocker to say this - the Deep Fried Pickles were #($&#( fantastic. 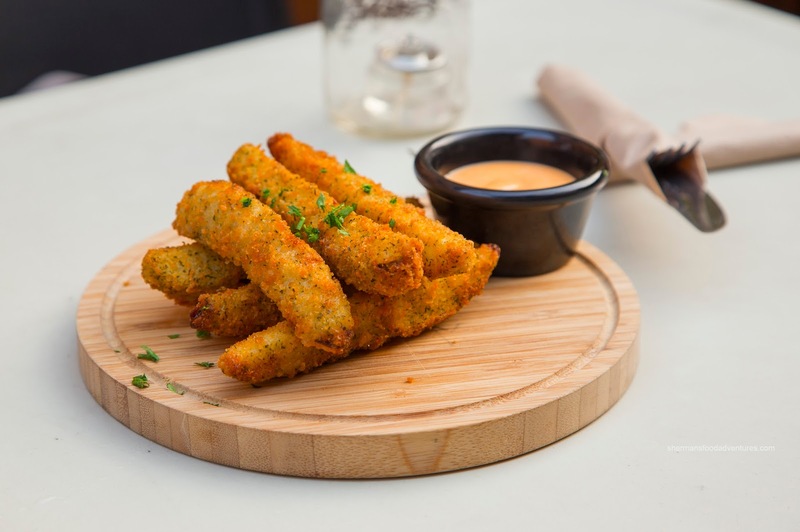 Yah, what's so special about fried pickles? Well, these ones featured a crunchy batter that clung on tight each house-made pickle. Sure, they were tart and salty, however, that's what beverages are for! The spicy mayo had a nice bite that helped bring down the saltiness a bit. 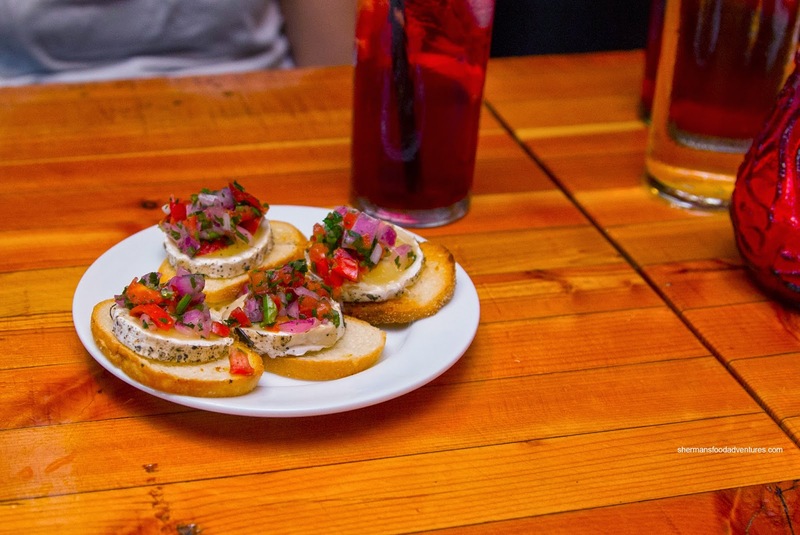 Moving down Lonsdale to El Matador, we sampled 2 dishes including the Grilled Goats Cheese with salsa fresca and Cheese & Chorizo Puffs made with tapioca flour. Unlike plain ol' goats cheese, the one they used here was potent and peppery. Hence, each bite was not longing for flavour. It was very gamy and melted in our mouths like brie. The salsa fresca was vibrant, yet ultimately mild which in turn let the goats cheese take the spotlight. Next, the puffs were indeed something we've never had before, especially with the use of gluten-friendly tapioca flour. Externally, it was baked golden brown being crunchy and cheesy. Inside, it was as expected with tapioca flour being a touch gummy and almost pudding-like (while still buttery). The chorizo was moist and had only a modest salt and spice level. 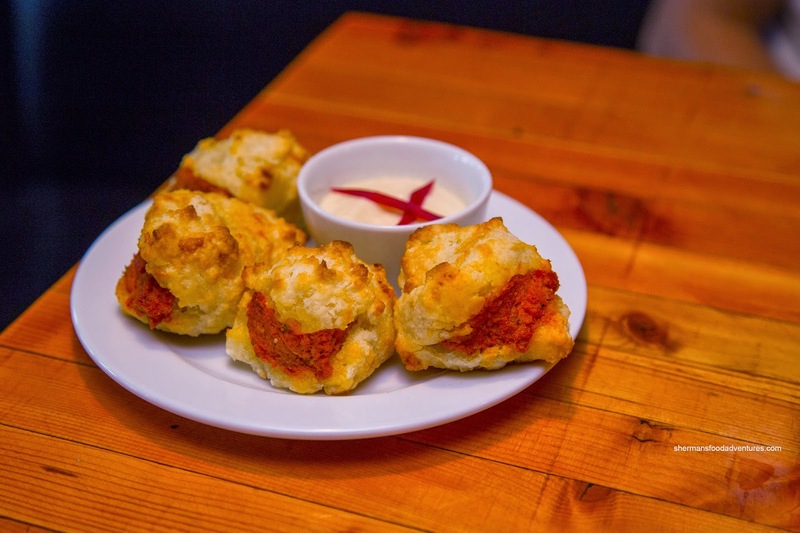 The garlic and apple mayo provided a sweet and aromatic hit to the puffs. At this point, we were already stuffed and could not do the main dishes as expected at The District. 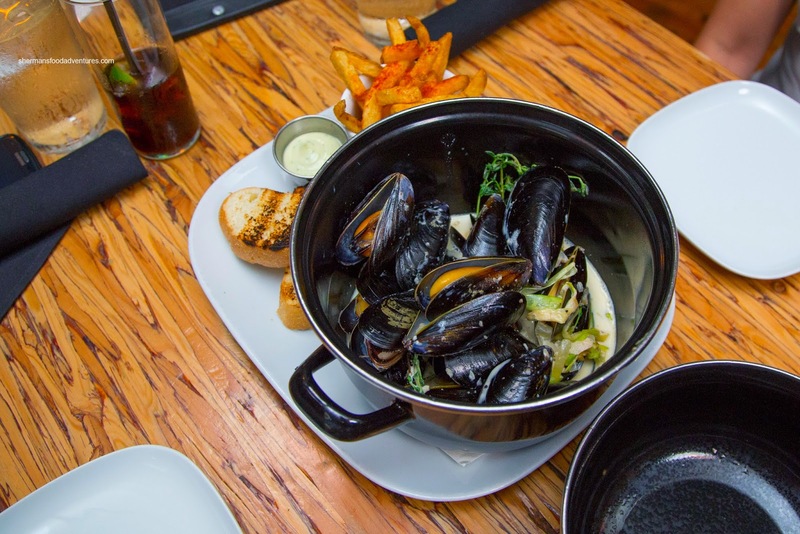 Hence, we decided to share the classic French Mussels with patat friet and grilled bread. I've had mussels at The District before (which are good), but this time, these were on steroids. The plump and huge honey mussels were buttery and sweet. Consisting of white onion, white wine, garlic, leeks and fresh thyme, the broth was creamy and impactful without being salty. It had a natural sweetness to it with a mild, properly-cooked down wine essence. As like before, the fries were crispy while maintaining their potato texture inside. Seeing how I've been to The District a few times already and sampled El Matador on a separate food tour, the only spot that was new to me was The Little District (which will be on my list to visit again). All 3 spots represent something different and a nice break from all the sushi restaurants along Lonsdale. Worth a look see if you just break down that invisible wall.